Sleeping comfortable in the great outdoors is easy when you have the best camping cot. You're out in the woods on a camping trip. You've set up your tent, you have your sleeping bag ready. You lay down on the ground and try to get comfortable. There's only one problem. The ground is hard, cold, and lumpy. You lie there for hours tossing and turning. You start stressing out how you're going to be tired the next day. There are extremely comfortable and very portable cots that you can take along on your camping trip. Cots that will help you get an awesome night's sleep and let you feel your best during the day. In this article, we are going to discuss what you should look for in a camping cot and also we are going to review the top 10 that you can get right now. 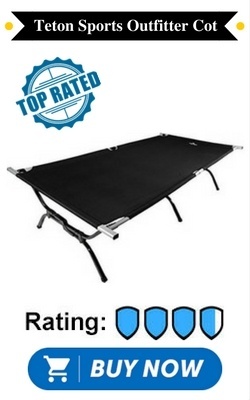 Let's first take a look at our summary table of the top 10 cots for camping so that we can compare all of their features. If you are on the edge of wanting a cot, have you considered a hammock instead? Check out our reviews over here. There are a few key things to look for in choosing your folding cot bed. Let's walk through them one by one. You'll want to think through who all will need to sleep on the cot, whether or not its for kids only or for adults too. Consider the tallest person that will sleep on it and write down their height. This will help you decide if the cot you get will be big enough for everyone that might need it. Not only is the size of the cot's sleeping surface important, you also need to make sure that the cot can handle the weight of the person using it. This obviously can be a touchy subject for a lot of us, so you might have to guess a person's weight, or simply buy a cot that is rated for a high enough weight so that you don't have to worry. It's important because you want the cot to last a long time. You also don't want the cot to break and potentially cause someone to get injured. When the cot is all folded up and ready to be transported, we call that it's carry weight. You'll want to make sure that you get a cot that is not too heavy where the person setting it up might struggle with its weight. 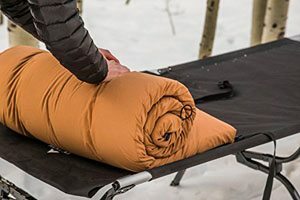 ​There are some more lightweight cots out there that are easier to move back and forth. Folding cots are definitely the way to go to reduce the carry weight. Durability plays a big role here too. You want a cot that is built with the right materials and is designed well so that you can use it for many years. Typically, you can discover how good the durability is by paying attention to the reviews of the cot to see how its performed for people that have used it a lot over a long time. Another factor is the type of warranty that a cot comes with if it has one. The higher quality companies will usually give you a warranty against defects. This is definitely something to pay attention to for the more expensive cots. Here we have our list of the top 10 options for you to choose from. 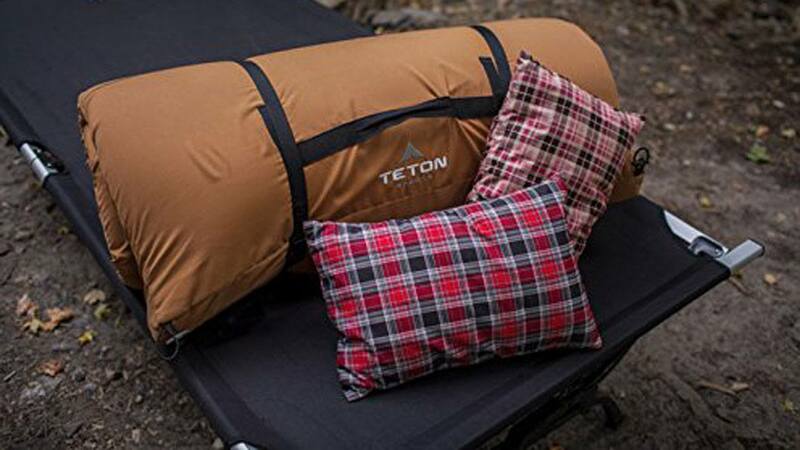 A strong cot, the Teton Sports Outfitter XXL Cot can hold up to 600 pounds. The aluminum frame and steel legs make for a lightweight cot that has an easy carry bag so you can bring the cot wherever your adventures take you. The lifetime warranty is just another guarantee that this cot is reliable. So many people give this cot a top rating which makes this cot an excellent choice for the money spent. It is easily the best cot you can get. For those people under six feet tall, the Coleman Comfort Smart Cot is modern and comfortable at the same time. The cot is very compact and durable and loved by many outdoor enthusiasts. 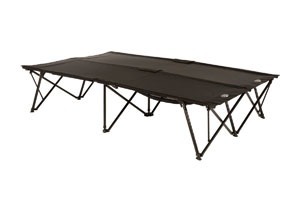 It has the ability to hold 275 pounds with a heavy duty structure and strong support system. There is a comfortable foam mattress for a cushiony night's sleep. There is a one year limited warranty on this modernized comfortable cot so if you have any issues with the cot the company is offering this protection for a year. This cot offers comfort and design at a reasonable price. If you are looking for camping cots for two, then the Coleman Queen Airbed Cot either sleeps one person or two people comfortably. Who says you have to squeeze yourself on a single cot when you are one person. You can spread out and enjoy this queen size bed and have the comforts of home in the great wide open. This queen size cot is great for couples in the great outdoors with this airbed and cot combination with cup holders on either side of the bed. The queen cot is strong and comes with a pump that takes four D batteries for easy use in the wilderness. The cot and airbed combo creates amazing comfort. It is a great two person cot. The Coleman Pack Away Cot with side table is very reasonably priced and loved by many. The cot has a sturdy steel frame that can hold up to 300 pounds. 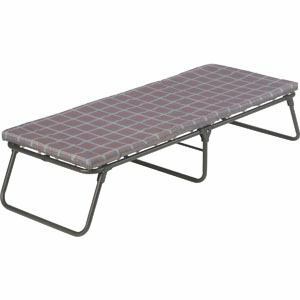 Extra long and easy to pack up and set up, this Coleman cot is great for taking on your next camping trip or to use wherever you need an extra bed. It can accommodate people up to 6 feet 8 inches tall. The side table makes it easy to read before you go to sleep and have a warm cup of tea, as well as have a place to put your cell phone. The Coleman Comfort Smart Cot Deluxe is a modern design cot that is strong enough to hold about 300 pounds. 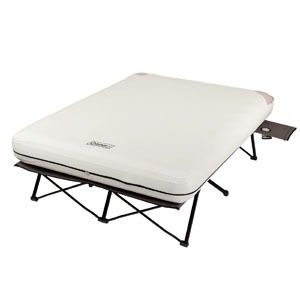 It has a thick foam mattress to bring the comforts of home to your outdoor experience. This cot will comfortably fit a six feet tall person and folds and unfolds with ease. This is a favorite of many who love the outdoors and want a reasonable price on their gear. This a sturdy and comfortable addition to your camping setup. 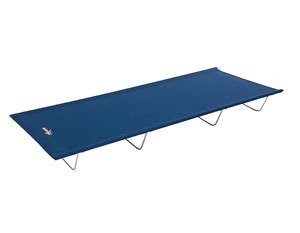 The Mountain Trails base camp cot is a low to the ground cot with a bright blue polyester durable base. This cot is tough enough to hold 225 pounds. The base is made of durable steel like all the good ones and comes with an excellent carry on bag for easy storage. 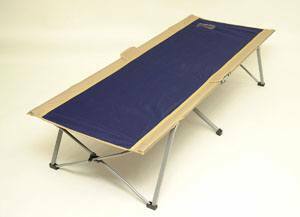 This is a crowd pleaser for a simple low to the ground cot. 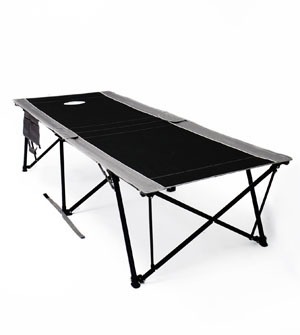 With a stylish black and grey durable frame and material, the Kamp-Rite Kwik Cot is an excellent double camping cot. It's cell phone and wallet storage pocket gives you something a little extra. An easy set and foldable take down will help make your outdoor experience more like home. It is another great 2-person cot option. 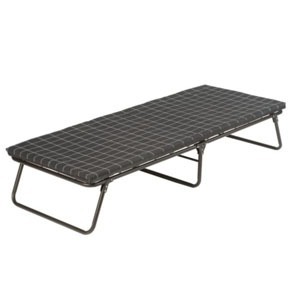 The Kamp-Rite Oversize Kwik Cot is a nice looking black and grey cot with a 84" x 33" sleeping surface. It is a perfect size for those of us that need a little more space for our comfort. It can handle a weight capacity of up to 400 pounds as well. There are two storage pockets on the side for our valuables. The cot breaks down very easily and weighs 25 pounds. 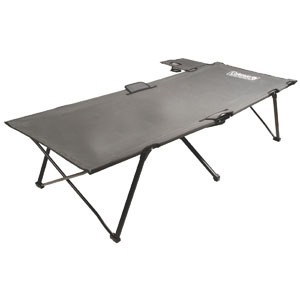 The Coleman trailhead II cot is a great addition to your camp. It is a simple, foldable, and easy to use cot. If you need a cot or a little extra sleeping option for kids or guests, this is the cot for you. It can easily fit a six feet 2 inches tall person and any height under that. This cot even comes with its own carry bag. For the price, this sturdy comfortable cot will come in handy as well as serve its purpose out in the field. The Byer Easy Cot is made out of very durable material, specifically 600 Denier polyester, which means it will hold up for a very long time. The cot can handle a max weight of up to 325 pounds. The setup time is under 1 minute, which makes this cot very convenient to set up and tear down. Camping provides a lot of fun ways for us to learn, and you do not want to miss it by having to worry about your gear. 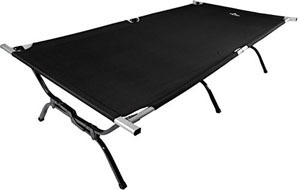 Any one of these top rated cots will provide you with an enjoyable camping experience thanks to not having to worry about your sleeping arrangements. If you have ever slept on the cold, hard ground, then you know the importance of having a nice cot so that you get the rest that you need. Getting the proper amount of rest on a camping trip can mean the difference between having a fantastic time, or having a terrible time. Make sure and get a great cot so that you can focus on fun and adventure.